The Pizza Business started in the Barbato family back in the 1930s by John and Agatha Barbato. The first pizza sold by the Barbato family was sold at a neighborhood club known as the Pratola Peligna society, also known as the P.P. club. They would make the pizza at home and bring it to the club, bake it and sell it for 5 cents per slice. This sparked the interest of their boys Pat, Nick and John. Pat and Nick who were in the service, had seen pizza shops in some of the bigger cities. It was then that they decided to open a shop in Erie. 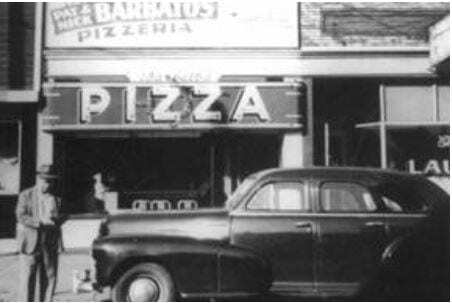 In the early 1950s Pat and Nick opened the first Barbato's. Pat and Nick were the original owners, however, the other brothers Fred, Al, and John (Chick) also helped to get the shop started. The original shop was located on 17th and State street where the Holiday Inn parking lot is now located. This original shop was strictly carry out. Shortly after the shop was in operation the redevelopment authority stepped in and took over that piece of property, forcing the Barbato brothers to move their shop directly across the street. This new shop was much more modern and had a full service dining area. As this shop became a success they felt that there was a need for a shop on the east side of town. Pat spotted a store in Wesleyville which is where they opened their second location in 1955. After a short time Pat and Nick decided to concentrate their efforts on the original location, so they sold their interest in the business to Fred and John (Chick). The shop was opened from 7:00pm to 11:00pm as John and Fred had other full time jobs. After a short time Fred and Pat decided to go into other business ventures. Pat sold his share to Nick and Fred sold his share to John. Pat and Fred opened the A-1 store, on 12th and French St. which is known today as Fred's Furniture and is run by Fred Junior. Pat eventually went into real estate investing. John (Chick) Barbato Sr., and his wife Amelia, the owners of the Wesleyville location, began making improvements including remodeling and invested in modern equipment. The recipes they used were favorites of Johns mother, Agatha. Johns sons John Jr., Rob and Mike continue using those same recipes today to continue the Italian tradition. Barbato's was the first to introduce the pre-baked pizza shell to the Erie market. This dramatically reduced the preparation and cook time. They were also the first in Erie to serve a round pizza and the submarine sandwich. 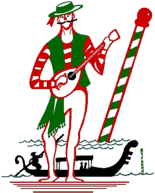 Barbato's motto for years used to be The Home Of The Round Pizza and The Submarine Sandwich. Today, both pre-baked pizza shells and fresh dough pizzas are available. With technological breakthroughs in pizza oven design, it is now possible to serve a fresh dough pizza with only a 3-4 minute longer cook time than the pre-baked pizza shell. The menu has been also expanded to include pasta dishes such as spaghetti, lasagna, gnocchi, antipasto salads and many other traditional Italian dishes. Over the years our menu has evolved to include other items such as, Bruschetta Bread, Homemade wedding soup, Calzones and our new lineup of Homemade pastas, Homemade gnocchi & Stuffed shells, to name but a few of the changes our menu has over gone. Barbato's isn't just a place for great pizza. We do specialize in Italian dishes but we have a wide variety of other menu items as well, such as, Seafood, Chicken wings, Salads and much more. We have affordable catering, offering all your favorites from our menu served up party style. Perfect for any size gathering, large or small. © 2019, Barbato's itallian restaurant & pizzaria. All Rights Reserved.